Nicholas Tse Ting Fung, Sean Lau Ching Wan, Mavis Fan Hiu Huen, Babyjohn Choi Hong Yik and director Wu Pinru two nights ago attended their film HEARTFALL ARISES (GAING SUM POR) charity premiere. Working with Ting Fung again, Ching Wan said that they already had a bond when they first worked together. Instead he had no bond with his frequent co-star Louis Koo Tin Lok. Ching Wan said, "So we keep going, until we do." Ting Fung said that he would not be the guest at girlfriend Faye Wong's upcoming concert. On the stage, Siu Huen revealed that when she shared the make up room with Ching Wan and Ting Fung they did not speak. Thus the set was very quiet. Ting Fung said, "You shouldn't be surprised, we made two movies like this." Ching Wan also said that after this film he did not feel Siu Huen was the same person in real life as in the film. He could not recognize her at all. Ting Fung explained that Siu Huen normally was little rock demon, in the film she played a doctor. 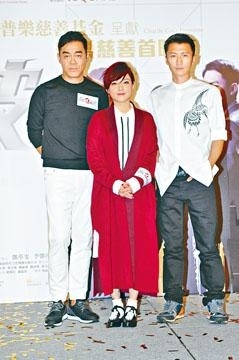 After the event, Ching Wan said that when he worked with Ting Fung the first time they already had a bond. "I feel that you don't have to work together often to have it. As long as two people click it is already there. (After over ten years with Goo Jai you still don't have a bond?) No, so we have to keep going until we do." Ting Fung after hearing about Ching Wan's countless collaborations with Goo Jai said, "I am jealous, I really like to watch Ching Wan's movies. Our collaboration has been great. We are on the same wavelength. In addition other actors on the team are in sync with us, which is very rare." He also said that he and Ching Wan did not like to speak on the set, which was a quiet as a library. Will Ting Fung invite his girlfriend Faye Wong to watch this film? He said no comment. Will he be Faye's concert guest? Ting Fung said, "No, I don't want everyone to misunderstand. (Will you go?) No comment." Ching Wan also avoided questions about whether Faye visited the set by looking up and down. Ching Wan said about not being able to recognize Siu Huen. "Two nights ago I still couldn't recognize her. She really can have a lot of changes." Ting Fung also said that he knew Siu Huen to be very rock, but this time her performance was very mild mannered. He felt that she had her own pace. Siu Huen felt that neither actor could recognize her, which made it fun. She also said that the character in the film was very big picture and flexible in life, much like her in real life. Did she feel both men were very cool? Siu Huen said, "What I felt wasn't cool, but a lot of fun. When they did not speak they were in their own world. As soon as they spoke they became a lot of fun. On the day of the production wrap I asked Ching Wan to make faces for a selfie, he was very nice. (How about working with Ting Fung?) By the end of the film I still wasn't too familiar with him, so I told him, 'I heard the song that you wrote recently for Chan Yik Shun. It's decent'. We started talking about music." The film was postponed form August to a release this month. Director Wu Pinru explained it was a scheduling issue. Now they had even more time to promote. He also revealed that the film had some minor adjustments but stressed that it did not involved anything political or sexual.